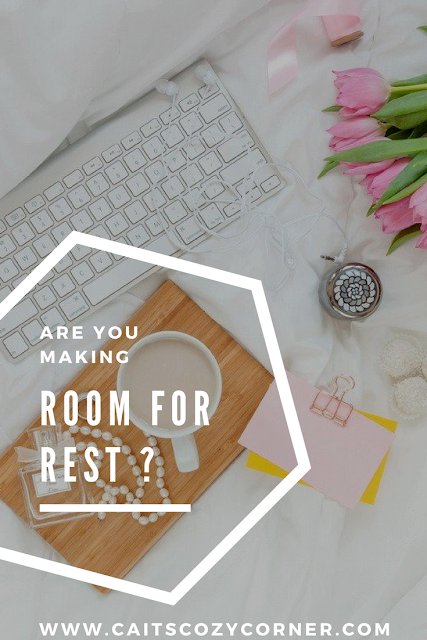 Cait's Cozy Corner : Are You Making Room For Rest? Are You Making Room For Rest? Well hey there friends! Just another fabulous day over here at Cait's Cozy Corner. But I wanted to talk about one thing that has been weighing heavily on my mind the last few weeks and it's something super simple. Before I decided to take this little blog of mine full time, I worked like crazy. Don't get me wrong, I truly loved working in the corporate world, being a Mom to two amazing kids, a wife to one great and handsome guy and then blogging the other 40% of the time. Was it crazy? Oh heck yes! Let me share something with you, rest and I are not friends. I really stink at it. On days where I actually had time and space to rest, I would be on the phone searching for something to fill my time with, avoiding the slow down or just the silence of it all. As we began to prepare ourself to move back to Chicago, I found myself actually welcoming the rest filled moments ( however few and far between they really were going to be). I started to really look at life and my business here as a place that needed some margins in order to appreciate the actual meat of the content. Without the space, without rest, I couldn't appreciate the busy, the good or even at times, the overwhelming of it all. I've never really worked out of place because I "had too" because in truth, I wake up excited to do what I do. 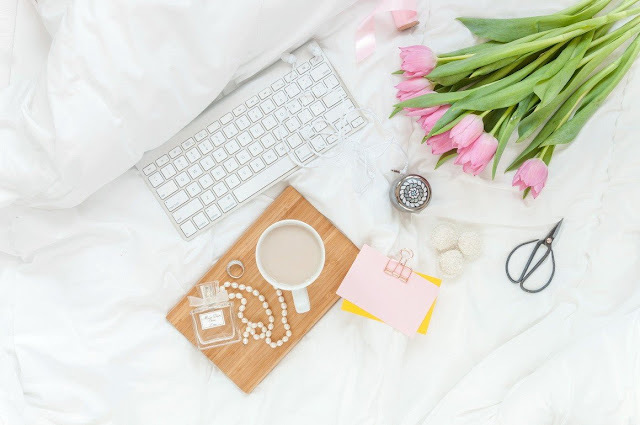 I love connecting with all you amazing girls and guys out there who want to grow and earn money from blogging. But not even just the perks that come with it- the hard work, the day in and day out we give our business but overall, the comfort and rest we truly need to take in order to do our job well! Make sure you give yourself the breathing room it deserves. I need that tough love once in a while. I need to know that it's ok to give yourself that time to just be silent, go for a long walk without your phone or just meditate. Whatever it is, are you making time for it in your life? Rest is SO important as a SAHM ! Sometimes it is just a few minutes in the bathroom while the kids watch tv haha! Self-care and rest are so important for our day-to-day lives! My job is so stressful and can make my brain so exhausted that sometimes I just come home and lay down in bed. I've been working hard on this. Self care is important! Came here to say this. Self care is always worth it! It's hard to rest when you're a parent working two jobs... But I try now and then to fit it in. I know that as far as sleep goes i don't get enough of it. Now as for rest, I can easily take a nap during the day when I'm not working. I'm a night owl anyway. But yes, self care is so important. It is what keeps us going. I love this! I definitely make time for me and time to rest - because I'm much more productive when I've been rested! I totally relate to this post - thanks for sharing! Thanks for the reminder Cait! When I am home lately I always feel like I need to be productive... so it has been harder to relax. This is such a good reminder for self care and taking a break every now and then!! Self-care is so important, yet so overlooked! I'm as guilty as the next Girl Boss! But the better we take care of ourselves, the better we'll be able to handle whatever comes our way! It's so hard when you run your own busy and barely have time to eat or sleep. I'm so trying to relax and take a step back! Self-care is SO important! I've been trying to be more mindful of it lately for sure! Resting really is important. I always take some time off to just rest. Blogging can be extremely time consuming, so I always take time for myself. I was having a moment of reflection about my schedule and realizing I need more time in the day to rest. I have been trying to get more sleep at night, but the days are still a race from sun up to sun down. Creating me-time and getting proper rest could not be more important. Thanks for inspiring me to go to bed earlier tonight. I am very, very slowly learning to prioritise rest. Like you, I am always looking for the next thing to do. I cannot sit still, whether I'm at home or work, but certain health issues have been forcing me to slow down a bit more and I can't say that I'm not grateful, because I am, as it's the only thing that actually makes me rest. Rest is also super important for the creative brain so that's another good reason to let yourself relax one in a while! This is such a great reminder. Giving yourself time to relax is really important. This is really inspiring! I am a huge self-care advocate but sadly I lack in this department as I am juggling so many different hats in my house. I will definitely make a bigger effort for rest and selfcare. Welcome (back) to Chicago! It really is the best city in the world! I got very sick a few weeks ago and since then I do all I can to make sure I am scheduling in rest! I hope other people do the same! Wow, I was just like you were.. working and blogging 24/7, I'm working on trying to do my blog solo for this upcoming year! But I'm definitely in need of more rest!! Something which i need to ponder upon...I am a SAHM mom and balancing work and home gives me no time to rest.As said self care is really important. Rest? What is that? LOL I need to take this advice and make time for it. I work way to much at times. I could definitely be making more room for rest, thanks for the reminder!! I totally get this. Finding balance can be hard. I published a post last Friday and it stated on Mother's Day I don't want presents I just want to be present! I can totally relate to this! Right now I'm a stay at home mom to my two energetic little boys and I've launched an educational website in my "free time". Rest does not come easily, but it is so important! Rest and self-care are so important! It makes all the difference! !